It’s one of the foundational pillars of every healthy and functional relationship — financial honesty and trust. When an aspect of your relationship is off, especially one like money that affects nearly every part of your life, there can be little (if any) progress forward. When you plan to spend a significant portion of your life with someone, honesty should play a starring role if you’re going to build a future together. And financial infidelity is, unfortunately, all too real in so many relationships. 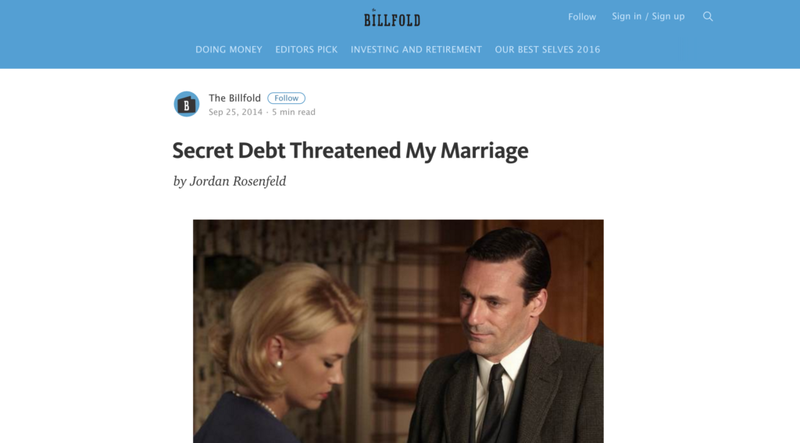 Some lying in a relationship comes from innocent like, “Yes, I paid that bill” *immediately logs on to pay said bill in secret* to more egregious lies like, “I don’t have any credit card debt” *racks up thousands of dollars per month*. Everyone should demand a certain level of financial transparency from their significant other, and we all deserve a partner who will enrich and better our life, not drag it down. Not so long ago, I stumbled upon an article that posed the question, Are You Cheating On Your Spouse — Financially?, which I thought was an interesting angle to consider. If you lie about your finances, is it just as bad as cheating? I, personally, think it’s just as serious because it generates similar feelings of resentment, distrust, and anger. It was shocking to see that the more research I did, the more I realized how common it is for people to lie about money. According to the article linked above, it claimed, “one in three adults who have combined their money in a relationship admit to committing financial infidelity against their partner. 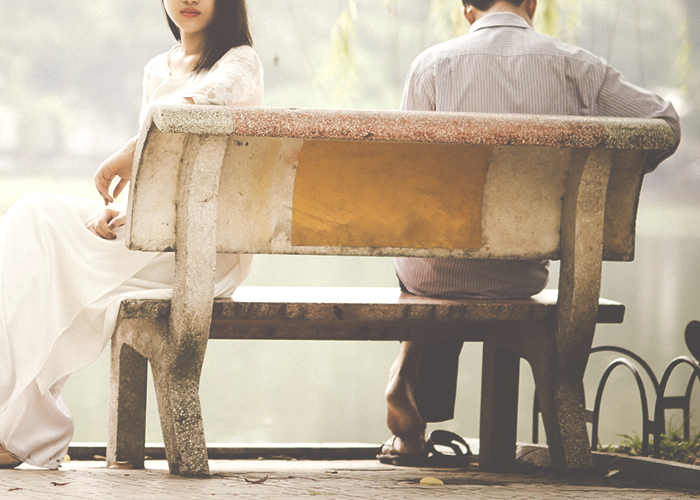 And, 76% of those people concede that their deception has affected the relationship.” Whoa. 76%?! I knew money was a common issue, but didn’t think so many people would admit to partaking in such an unhealthy dynamic. From there, I researched to find stories of people who discovered their partners were lying about money. I was curious to read about the fallout, what happened next, and how they handled it moving forward. Below are five financial infidelity stories of people who experienced this kind of thing firsthand, and what they did next. Take a look! 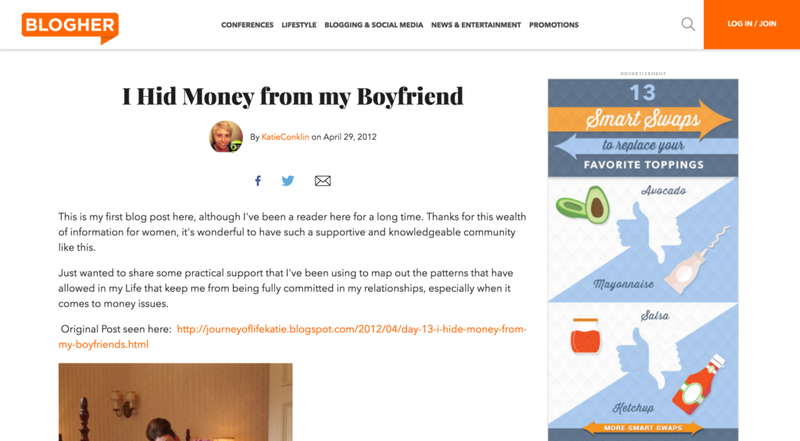 This article is an interesting personal essay type of confession piece about money in relationships. A young woman reveals that anytime she would get extra money she would hide it away, and keep it from her partner. She was lying about the money being stashed away, but when finally confronted about it, she admitted she was doing it out of fear to protect herself if she ever needed a back door exit from the relationship. The piece goes on to explain the reasons why she felt it was necessary, why it was wrong, the part of it that she felt was justified, and how she’ll move forward with her significant other to a place of financial honesty. 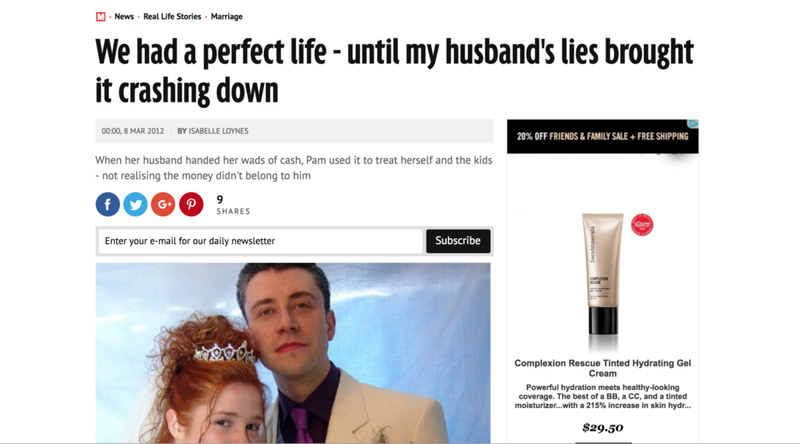 This is a truly insane story of one couple who had a “perfect life” that went horribly downhill quite suddenly The wife, Pam, discovered that her husband had been stealing money from the pharmacy he worked at, was caught, and had the police called on him. I can’t imagine discovering that about my husband, and it would truly feel as if the world had stopped turning. Pam talks about the decision she made, how she handled the massive breach of trust, how the couple tried to work it out, and what happened next. At one point she says, “He was depressed and at rock bottom. I couldn’t motivate him to look for work. We weren’t able to pay the mortgage on the house, so we lost it. All of a sudden, it felt like our life was disappearing from around me.” Yes, the title of the article is a little #gossiprag sounding, but it really was an interesting read which shows how people effectively cope with a situation that bad. One woman explains how she came to admit she had over 10k racked up in credit card debt to her then-fiancé, only AFTER he came home from work scandalized by a story his coworker told him. She commented on the irony of it, and admitted that it was a secret she has been hiding for a long time, saying “Could I imagine it? I was living it. I don’t know how long I sat there, silent. We were going to be married in less than a month. If he was scandalized by five thousand dollars, my own secret could be a game changer.” She then goes on to talk about how they dealt with her debt, what steps they took to rectify the situation, how she sought to earn his trust back, and start to rebuild her finances and the part of the relationship that had been damaged. Check it out. One woman describes how she met the love of her life, felt an immediate connection with him, and began excitedly mapping out a joint future together with him. Cue financial curveball — he had 19k in credit card debt and an exceedingly-low credit score. Once she discovered that information she recounts how she immediately sprung into action and proceeded to lay down the financial law (after first picking her jaw up off the floor). 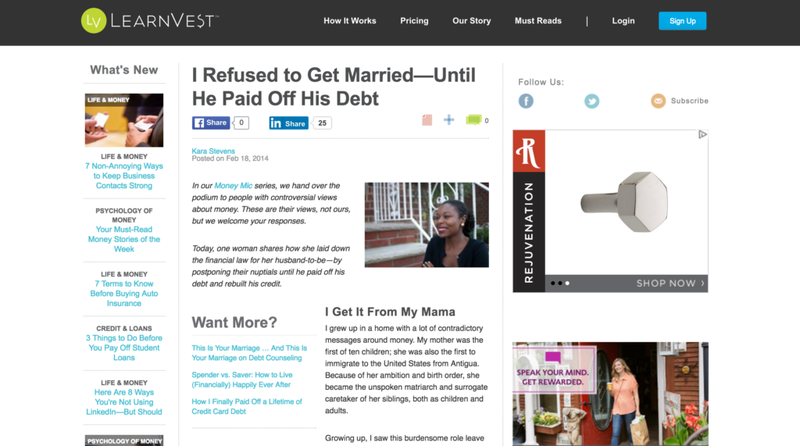 She clearly stated that she wouldn’t marry him until he paid off his debts and raised his credit score. 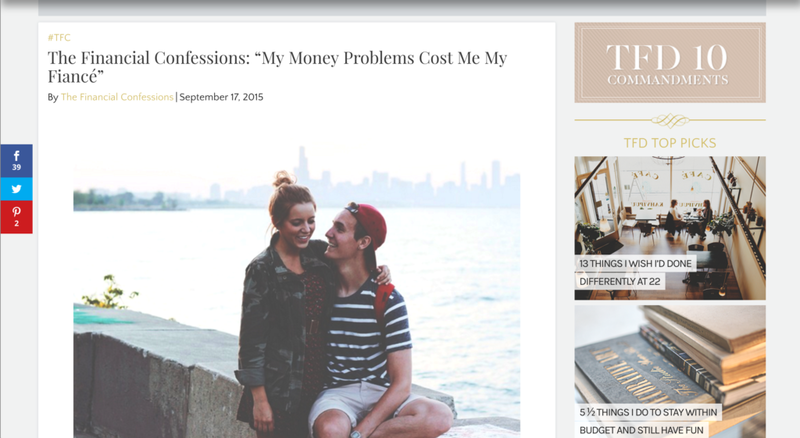 It’s an interesting article because it explores a relationship where the two individuals are on completely different financial pages, but still manage to make it work. It’s a controversial opinion for sure, and one that I’m not entirely sure I agree with, so it was a super-interesting article to read through. It’s definitely worth checking out! One of our very own TFD articles from the vault. The author explains how money problems contributed to her failed relationship, and that her and fiancé were unable to cope with their issues, which led to their ultimate demise as a couple. She explains that the relationship ended on bad terms with no formal break up or meaningful discussion that helped them move forward in a positive way. She says, “We didn’t ever really have a big ‘breakup moment,’ we just stopped talking much until I offered, by email, to send him back the ring, and he told me to sell it, because I needed the money.” Read the story in full for the details of exactly what went wrong, and why the relationship couldn’t be saved.